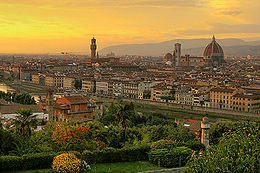 A spring holiday in Florence: can you imagine the mildest days ever? Renaissance fleur, farmers’ markets and art: Accademia and Uffizi galleries are open for you! Nice to discover also treasures from Egyptian expeditions for free at the Museo Archeologico in the Palazzo della Crocetta (Via della Colonna). Or why don’t you check the Galileo’s original telescope at the Arno riverfront Museo di Storia della Scienza in Palazzo Castellani? Nice also the Museo dell’Opera del Duomo behind the cathedral. If you are really interested in home made artisans’ masterpiece, you should come to Florence in Spring time!!! The exhibition centre behind Fortezza da Basso’s battlement walls are open to host the Mostra Internazionale dell’Artigianato. Ceramic pieces and handmade dress jewellery are in the stalls during April’s last week. Fun will be also to go to San Lorenzo street market: loads of discounts on leather prices. During your spring holiday in Florence will be interesting also to join the Antique Fiorentino fair in Piazza Santo Spirito: it will be held on the second Sunday of every month where over 100 stalls gather. Honey and herbs instead are the stars in the Fierucola farmers’ market on the third Sunday of the month. April means the start of two months of melody for the Maggio Musicale Fiorentino music festival. Symphony performances entertain music addicted at the Teatro Comunale municipal theatre. The “melomani”, the opera lover will meet at Teatro Piccolo. Go to Boboli Gardens where camellias bloom, or go to the Bardini Gardens, among the restored Renaissance statues and parfumed in the scents of flowering wisteria. The Botanical Gardens are free tor a walk among ancient oaks. A spring holiday in Florence on an old boat or barchetti on the River Arno will be more than a treat! The Culture Week, or The Settimana delle Beni Culturali is a week for free-pass in all the public museums and monuments: in florence you will see for free the Accademia and the Bargello! This entry was posted on Tuesday, April 24th, 2012 at 10:27 pm	and is filed under Events in Italy. You can follow any responses to this entry through the RSS 2.0 feed. You can leave a response, or trackback from your own site.